If you are one of those who love active mountain holidays, Bormio and Hotel Alpi e Golf make your perfect option. Open almost all year round, we are ready to introduce you to Valtellina's wonders, summer or winter. Book your next bike holiday with your friends. 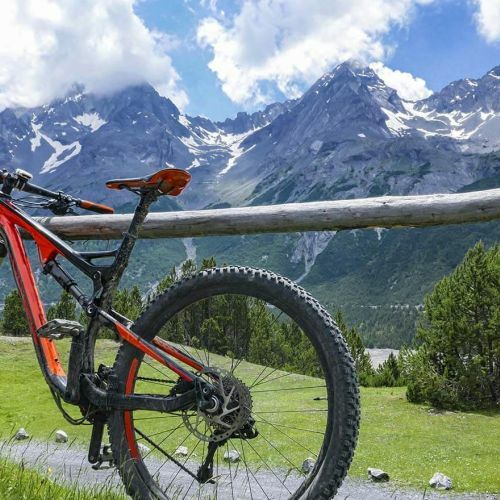 MTB or road cycling, Valtellina is just paradise, and we have a garage at your disposal, in addition to specialising in accommodating biker parties. And after an active cycling day? Or a walk along the trekking trails? Or after skiing - of course! After doing sports, there is nothing better than sitting at the table to fully enjoy taste while restoring your energy. Discover Valtellina's typical fare and do not miss out on our substantial breakfast! When they ask you where you have been, you can answer “up in the mountains, at friends'”. We make our guests feel so at home that they often reward us by coming back the following years. We are located close to the village centre, yet sufficiently tucked away to guarantee you thoroughly rest and relax. A number of cycle tracks, including the celebrated “Sentiero Valtellina”, unwind near us. What can I do and see? We will tell you! No need to waste time surfing the web to find something to do in Bormio and the neighbourhood. If you are looking for ideas and advice, you can follow our blog or subscribe to our newsletter to find the inspiration. In the morning, free shuttle service to the ski lifts!